A company’s reputation is built upon customer reviews, and that is why we are so proud of our 9.1/10* customer satisfaction rating on Independent review site Trust Pilot. 95% of our reviews are 4 star or above*, and we couldn’t be more grateful to the customers who take time out of their busy days to leave us their thoughts and comments. Ms Martin gave Holidaysafe 4/5 stars and left the following review: “Have just renewed with Holidaysafe…Easy to use web site that offers good insurance cover at a reasonable price. Even the declaration of medical conditions was easy and was handled well. I have just renewed as I was offered a good price. However, as yet have not had to make a claim so cannot comment on how this side of the business is handled.” Once again I would just like to thank Ms Martin for taking the time to leave us her feedback; we hope she enjoys spending her voucher. 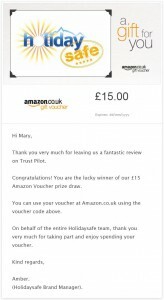 If you’re a Holidaysafe customer who would be interested in winning a £15 Amazon Voucher, simply visit our Trust Pilot Evaluation page and leave us your honest feedback on our prices, products and services. Once your review is posted you will automatically be entered into our prize draw for that month, and we could be contacting you next!